Hello Everyone!I thought I would start with another picture of me since I know you all like to see what’s behind the curtain!! The quality suffers when you reverse the camera on the iphone. Yeah, that’s why I don’t look drop dead gorgeous!! ha ha. My sweet husband has already gone to work so it’s me, my arm and one messy desk. Yup, it’s messy desk day. No surface can be found equals I have been a very busy girl! Let’s start at the left side of my desk. I just bought some Martha Stewart cotton hemp yarn in the sales bin (score). Up in the corner you can see my storage I made for my Spellbinders a while back. I love it on my desk in my little Nantucket basket. It think I actually use them more. Some new stamps I found at Michaels. A Halloween card I made is tucked under the stamps. I just got my first Anya stamps. They are so stinkin’ cute I smile every time I see them. I didn’t realize you have to cut them yourself. So I brought out my Tim Holtz scissors. But I am thinking I might invest in some rubber stamp scissors since I know will be buying more Greeting Farm stamps. One of my smash albums is out. I use this one to store card ideas, sketches and instructions for making some interactive cards. I pulled out some of my very old, Marvy LePlume markers to create a fun to do list for myself. Yup, and I never put them away. In the back you can see some of my washi tape hanging on the wall. They are another source of happiness in my room. I love seeing them. If only I would use them more! Below all the stamps and stuff you can see a sheet of new business cards. Yes, I decided not to add the expense of paying someone to design and print my business cards. I designed them myself and I print them as needed on my printer at home. Works for now. Why all the mess you ask? I have been feverishly trying to crank out some autumnal and Halloween cards for Belinda’s Crafts, my etsy store. Many things seem to slow me down – procrastination while I eat some cookies, checking my fingernails for breaks, watching a little TV, surfing the web, oh and an actual real excuse was I was having difficulty getting the photos processed correctly for Etsy’s requirements. But I am happy to say that I have put them up on the store and would love you all to take a peek. Maybe, dare I say, consider purchasing? Oh I know, no plugs so at least take a look at them. Well I could blab all day long but that wouldn’t be fun for anyone so I will kindly exit now and go snooping. 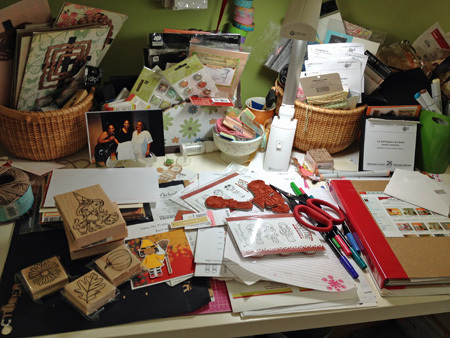 If you haven’t learned about this amazing creative journey you can take every Wednesday, then head on over to Julia’s Stamping Ground and you will find desks from all around the world for What’s on Your Workdesk Wednesday. Previous Postnew product release: HALLOWEEN CARDS!! Joynana, thank you for your sweet words, I tend to be the ‘behind the scenes’ kind of girl so this is new for me actually being in the photos. 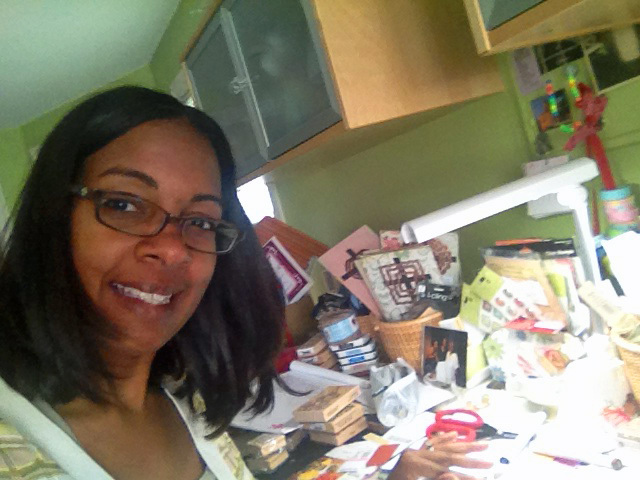 I love to see a messy desk! I’m a little late but still wishing you a happy WOYWW! I think the camera phone photo looks good! I always thought it was me and having so little “leg room” on my desk but I guess thats just the way we all work best. I know I make a mess in a circle around me like the Tasmanian devil when I scrap! Question your dies in the background what is the method you’re using to secure them?